Who will make up the next government? IF FINE GAEL WIN over 60 seats in the next general election, it will turn to smaller political parties such as Labour and the Greens to form a government. According to Tánaiste Simon Coveney the party wants a “successful local election that can be a springboard then for gains in a general election”. “Fine Gael is intent on winning well above 60 seats in the Dáil the next time around. I think we need to that to be in a strong position to form a government that can command a majority,” he said. Knocking on the door of Labour and the Greens? “I think so, but we’ll have to wait and see how other parties do in that election. We have ruled out Sinn Féin as a coalition partner. That is a very real ruling out, it is not going to happen. “We will have to wait and see where entities like the Independent Alliance, where the Green Party is, where the Labour Party is. And of course, they have to be open to it too. “That is a discussion that we have post the election when we see the arithmetic of the new Dáil. I hope we will be in a position to form a government that commands a majority so that we can continue to build a stronger, fairer, economy and society,” said the Tánaiste. But what about Fianna Fáil? Coveney failed to mention Fianna Fáil when speaking about possible coalition partners. I think after the next election we are unlikely to see coalition between Fine Gael and Fianna Fáil. It is a possibility but I think it is unlikely. I think you are more likely to see, hopefully, a strong Fine Gael coming out of the next election, looking to build a partnership and an alliance with other parties where we share agendas and that we want to complete together. Certainly I’d like to be part of that. It is no secret, by the way, that before the last government was formed I would have been a very strong advocate for a very strong rainbow coalition with parties like the Labour Party and the Greens as part of that. It didn’t happen. Who knows, maybe it will happen after the next election. I wouldn’t take any of the other parties for granted, this will be a matter for parties to decide their priorities, what they want after the next election and we will have to see what the numbers dictate. Taoiseach Leo Varadkar said “there won’t be an election” in the next 12 months, but when pressed on whether that is a certainty, he waivered. “Given the uncertainty around Brexit, and that we, as Fine Gael and independents in government, that with Fianna Fail we will try to negotiate another budget. “There’s always the possibility that we won’t be able to negotiate that budget but we’ve negotiated three and I’d be confidence that we could negotiate four. So my plan is to focus on getting the job done — on securing the withdrawal agreement, if we can’t, managing a no-deal scenario, facing obviously into European and local elections in May and getting on with the business of government. So I’m not making any plans to call an election by any means,” he said. Coveney, who was part of the confidence and supply talks with Fianna Fáil these last few weeks (the talks which resulted in no big wins for FF), said Micheál Martin had made the “right decision” in renewing the deal in light of Brexit. “It allows us to plan now without looking over our shoulder all the time for the potential triggering of a general election, so that’s good,” he said. One thing Fine Gael are planning for are the local and European elections. 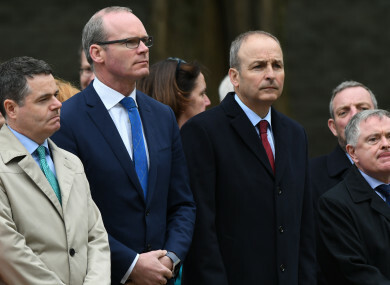 “The local and European elections are really important for Fine Gael,” said Coveney, who added that his party didn’t have a good local elections the last time around. In terms of the European elections, the party want to hold what seats they have, but Coveney wants to make “significant gains” in terms of local elections. “I think we can do that. I think we have the candidates to do it,” he said. “We still have a lot to do, but I think we will go into the next election with a very strong economic growth story, I hope having protected the country through a very difficult Brexit process, well on our way to fixing a broken housing market in Ireland which was broken during the recession which has taken time to fix and a long way down the track in fundamentally reforming a health system that needs to be reformed too”. If all fails, and the party does not reach over 60 seats and finds itself in opposition, will Fine Gael reciprocate the same deal as Fianna Fáil? Is a confidence and supply role reversal on the cards? Email “Fine Gael will seek Labour and Greens support as future government partners, as Leo fails to rule out 2019 election”. Feedback on “Fine Gael will seek Labour and Greens support as future government partners, as Leo fails to rule out 2019 election”.